The Ukrainian central bank publishes the official exchange rate daily. At the time of this posting, the "official" exchange rate is 16.24 Hryvnias to one US dollar (posted as 1624 to a hundred dollars), nearly identical to the chart below. 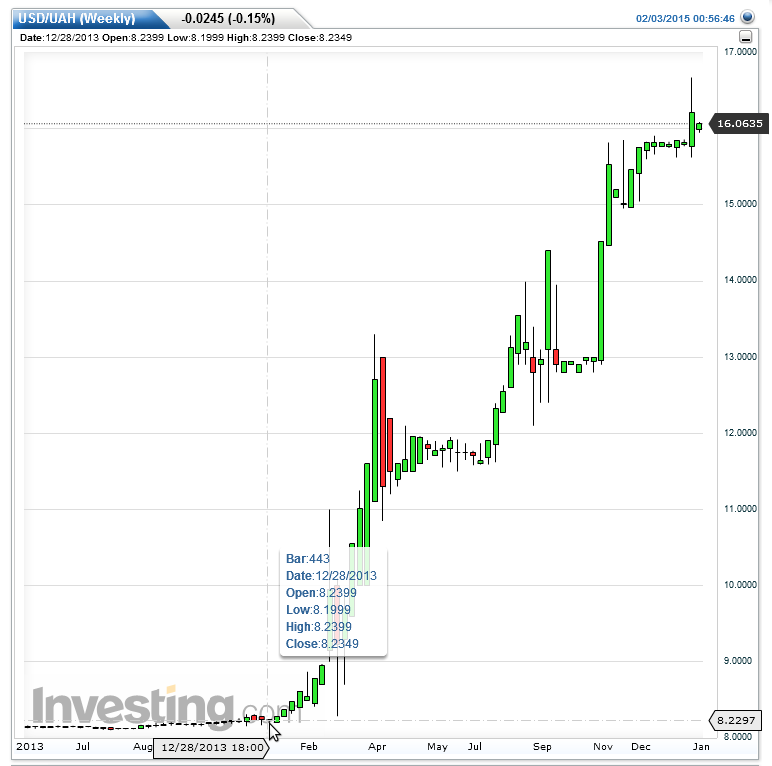 The above chart show the Ukrainian Hryvnia is down about 50% since the beginning of 2014. That's a pretty steep decline, but the true picture is much worse. A black market has developed because the official peg is too generous. Ukrainian citizens have crossed the border, maxed out debit cards with cash transactions at the official rate, then cashed in on the difference. And exporters selling goods at the official rate have started to complain about huge losses. Merchants will gleefully give you 16 Hryvnias for a US dollar, but you will lose mightily on the transaction because the black market rate is more like 21.5. Exchange at the official rate and you immediately lose about 25%. Ukraine wants to kill the black market, but the only way to do so is float the currency. Yesterday, the National Bank of Ukraine posted (in English) Banking Community Advocates Shift to Market-Based Exchange Rate-Setting Mechanism. Here's a Ukrainian source that claims the Hryvnia Will Float on February 5 but it is not an official document. While waiting for the free float to occur, banks needed to do something to halt the spread of debit card cash transactions at the alleged official rate. This was the solution: Banks Impose a 30% Foreign Exchange Fee. The article notes that in the border towns in the Ternopil region, Lviv, and Transcarpathia, that people had been running to the nearest ATM in Romania or Poland to remove currency, at the official rate. Customers used gold class preferential commissions for ATM transactions buying dollars for 16 Hryvnias, then selling the dollars at the black market rate that is as high as 21.5 Hryvnias to the dollar. Ukrainian banks were getting killed on debit card and other exchange transactions, thus the support for a free-floating Hryvnia. From 8 to 21.5 represents a 62.7% decline. And I suspect it won't stop there. Why should it? A plunge from 8 to 30 would be a 73% decline in just over a year. And that's my initial guess barring some quick monetary rescue by the IMF. If and when the Ukrainian National Bank does float the currency, other sites will note the "shocking overnight" plunge. In reality, the plunge has already taken place, over time. The charts just don't show that yet.